Shamefully, this remained on my Goodreads "currently reading" shelf far longer than it should have. It actually haunted me every time I logged on, making me feel guilty and shameful that I hadn't finished yet. Oh the woes of a book nerd. Scarlett started writing to Legend, the master of ceremonies of the mysterious and magical Caraval, when she was a young girl. She pleaded with him to bring the performance to her small island, but letter after letter remained unanswered. But then, many years later, she received an invitation which was quickly followed by a whirlwind of activity in which Scarlet is kidnapped by one guy, her sister is kidnapped by another guy, and the game begins. Things I like 1) mysterious carnival like dream places 2) mysterious loner dudes and 3) mysterious masterminds who could be good but in all likelihood could also be bad. Done. Done. And done. Garber jumps immediately into the action and stars building a world that is both interesting and dangerous. 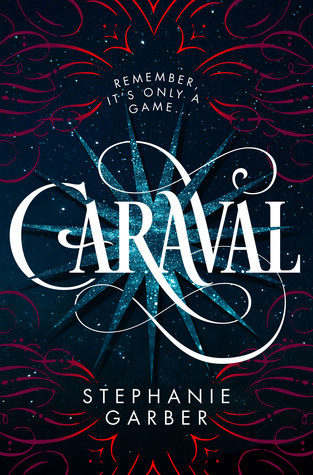 It reminded me a lot of Erin Morgenstern's The Night Circus with the setting coming alive as a another, equal parts dark and magical. It was a little disappointing that both Scarlet's life on the island with her horrible father, and time spent in this fantastic game setting, was focused on the need and convenient want for a gentleman. I wanted her to be a little stronger and more independent than she was, but given her background her actions were easily explained. There are a lot of moving parts, a lot of characters to keep track of, and a lot of plot to be sorted out. I was confused on occasion, but Garber always found a way to bring me back into the fold. The action starts right away and doesn't stop until the very end. And I was sad when it was done.